Ask any adventurist about his favorite adventure destination and you will get a unanimous reply 'The Grand Indian Himalayas'. The mighty Indian Himalayan ranges are a home to almost every thrill filled activity, be it a trekking, rafting, skiing or mountaineering. Read below to know more about the audacious activities that you can enjoy in the Himalayan ranges. Conquering the heights of the snow-dressed mountains is certainly not a piece of cake as it requires a strong willpower, maximum stamina and the never give up attitude. However, as per Barry Finlay (a famous author), "Every mountain top is within reach if you just keep climbing." This quote should provide the spirit to every mountaineer while he or she heads off for the mountain climbing. Exploring the pristine beauty of the Himalayan peaks means a beautiful adventure trip. Beautiful hills adorned with tempestuous rivers, represent the exquisiteness of Mother Nature at its best and an excellent way of enjoying this beauty is through camping in the Himalayas. Camping is one such adventure sport that includes various activities like trekking, nature walking, bird watching and fishing. The fresh air that you inhale during the camping tour is unadulterated and thus, you feel rejuvenated. When the high rapids of great grades are complemented with a challenging passage, you feel a tingle in the back of your neck. Thus, whenever it comes to venturesome water sport, kayaking is among the most preferred choice. Note: Kayaking requires high professional training. Skiing is another thrill packed activity offered by the snow-covered fields. This adventurous and fun activity lets you explore the exquisiteness of plain white ice. Enjoying skiing on the white canvas is an experience of a lifetime. If you wish to explore every nook and corner of the enchanting Himalayan valleys and villages, jeep safari is the best option for you. It lets the travelers explore the twisted rocky terrains and at the same time treats their eyes with the magnificent natural sights. This thrilling activity also brings the visitors close to the local culture of different places. Besides jeep safari, mountain biking is another wonderful option for accessing the remote areas of the Himalayas. Rugged topography, picturesque vistas of the nature and interesting cultures greet you during the biking tour. Thus, an adventure trip cannot be considered complete, if you have not experienced mountain biking. Mountain biking tour will gift you marvelous memories to cherish forever. Trekking has always been the unanimous choice of the adventure lovers. As the mighty Indian Himalayan ranges are bestowed with oodles of trekking trails, it invites both experienced and amateur trekkers for a memorable journey. Along with the above-mentioned treks, there are various other trails concealed in the arms of Indian Himalayan ranges that satiate the genuine hunger for the adventure. "I have never seen a river that I could not love. Moving water...has a fascinating vitality. It has power and grace and associations. It has a thousand colors and a thousand shapes, yet it follows laws so definite that the tiniest streamlet is an exact replica of a great river. This is the magic of the white water that entices adventurists from different parts of the globe to indulge in river rafting, especially in the Himalayan Rivers of India. 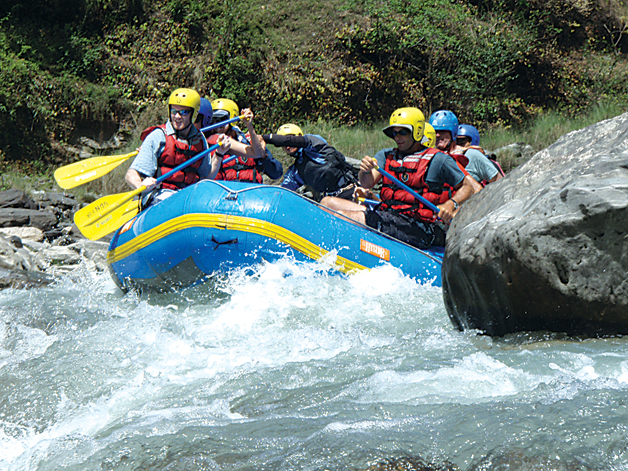 Whether it is river rafting in Ladakh or Garhwal, the highly challenging rapids of the rivers make the expedition worthwhile. Owing to all these activities offered by the Himalayas, India adventure tours have become the most preferred choice for the adventurists.